For the bishop and priests of the Raleigh, NC Diocese.
" As for the rest since we have fallen on these evil times let us take care first and foremost, as good soldiers of Christ, not to lose heart. Indeed, in the very storms in which we are tossed, there is a certain hope of achieving future tranquility and greater serenity in the Church. So let us arouse ourselves and the toiling clergy and laity, propped up by divine help and inspired by that most noble statement of Chrysostom: "Many waves and dire storms, press on but we do not fear lest we be submerged, for we stand on a rock. Let the sea rage, it cannot dissolve the rock. Let the waves rise, they cannot sink the bark of Christ. Nothing is stronger than the Church. The Church is stronger than the heavens. Heaven and earth shall pass away, but my words will not pass away. What words? Thou art Peter and upon this rock I will build my Church and the gates of Hell will not prevail against it. If you do not trust the words, trust the deeds. How many tyrants have tried to oppress the Church! How many cauldrons, furnaces, teeth of beasts, sharp swords! They have accomplished nothing. Where are those enemies? They are handed over to silence and forgetfulness. Where is the Church? It shines brighter than the sun. Their deeds are extinct, its deeds are immortal. If when they were few, the Christians were not conquered, how can you conquer them when the whole world is full of this holy religion? Heaven and earth will pass, my words will not pass away." Therefore not moved by any danger and not hesitating at all, let us persevere in prayer. Let us all strive to placate the celestial anger provoked by the sins of mankind so that the Almighty will rise up and command the winds and bring about tranquility. " My Lord Jesus Christ, Who didst found the Church with Thy precious blood, and by the preaching of the apostles didst establish, propagate, and extend it throughout the whole world, and thereafter didst commission the holy patriarch Dominic to adorn, illustrate, and defend it with the splendor of this merits and doctrine; graciously hear the prayers which this apostolic man incessantly offers to Thee for the increase of her treasures, both spiritual and temporal. 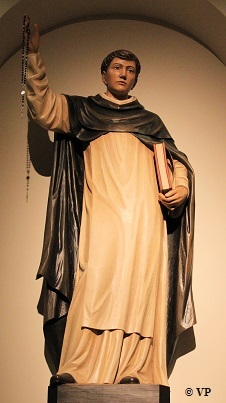 Most merciful Redeemer, Who didst choose as Thy fellow-laborer for the salvation of souls, St. Dominic, who by his zeal, aided by Thy grace, gained over to the Church so many heretics who had been lost to her, and so many sinners who had grieved her by their obstinacy; send, O my God, ever fresh laborers into Thy vineyard to work for Thy glory, and gather in the fruits of eternal life. O Good Jesus, Who didst delight to see St. Dominic prostrate every night before Thy altar, adoring Thee hidden in the most holy sacrament with most lively faith, and offering up, now groans, now prayers, now penances on behalf of the Church, at that time persecuted by her enemies and profaned by her servants; defend this Thy Spouse through the intercession of St. Dominic from the outrages and plots of the infernal enemy of mankind. V. Pray for us, St. Dominic. Let us pray: Grant, we beseech Thee, almighty God, that we who are weighted down by the burden of our sins may be raised up by the patronage of Thy blessed confessor Dominic. Through Christ, Our Lord. Amen. With God: A Book of Prayers and Reflexions by Rev. 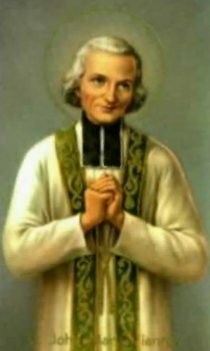 Francis Xavier Lasance.